Shri Kshethra Dharmasthala Rural Development Project organised 37th state-level Kisan Mela at Bailahongala taluk of Belgaum district from January 25 to 27. This was a part of annual Krishi Melas which are being organised in various part of the state. 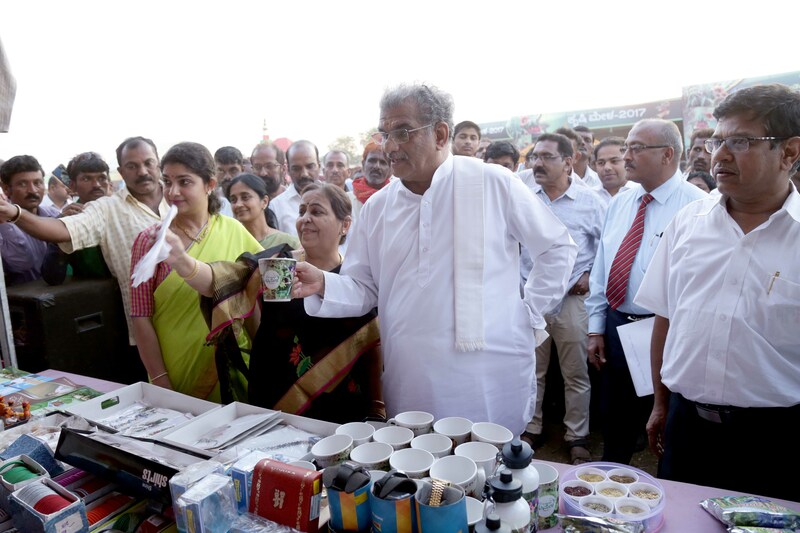 Approximately 3 lakh farmers and women visited the mela to pick up the modern technologies of farming. The Krishi Mela which began with rich Shobhayathra, was inaugurated by former chief minister H D Kumaraswamy. MP Suresh Angadi inaugurated the Agriculture exhibition stalls by unveiling bamboo basket and stand. Geology and Earth Science Minister Vinay Kulakarni, Nabard Chief General Manager M I Ganagi, SKDRDP Trustee S D Sampath Samrajya, MLA D B Inamdar, Krishi Mela President Dr Vishwanath I Patil and others were present. The shelter was 220 feet long and 180 feet wide, which can shelter around 10,000 people at a time. The main stage was decorated with fruits, vegetables, flower, grocery etc. The stage was huge with 60 feet length and 40 feet width. The LED screen itself 32 feet in length and 10 feet in width. This time SHG members had opportunity to demonstrate their product before sale. Including 18 stalls of agricultural machineries, there were around 618 stalls opened as a part of the event. Shuddaganga unit of community development division provided pure drinking water. As a part of Jnanavikasa women’s interaction program, five Jnanavikasa members were honoured with ‘Jnanavikasa achiever’ award. Preparation of dishes in a huge kitchen- ‘Annapoorna Bhojanalaya’ and distribution of meals was amazing sight. Typical north Karnataka dishes attracted food lovers. Nearby families prepared around 8 lakh rotis and gave for the lunch at free of cost. Delegates from across the state took part in the three-day deliberations held over 13 technical issues. The mela came out with a set of recommendations which were submitted to the Chief Minister Siddaramaiah who was present in the valedictory program. ‘Krishi Sadhaka’ awards were also distributed on the occasion. With the active participation of huge number of people, the Krishi Mela became a memorable event in the history of Belagaum.